So the red top-down went missing. It wasn’t as if I could call the police. Not that I had left the keys in the ignition. The trouble was it was an imaginary 1963 red MGB. I found it myself in the word document titled Hour of the Hawk v.8 for Vellum, put it back where it belonged between Chpt. 4 “Too Many Kids” and “The Sitter” which had got promoted to Chpt. 5. O.K. done! But no!!! One hundred and four people had already downloaded my mystery Hour of the Hawk. (joycehowe.com) Without that clue-filled chapter, they wouldn’t understand the vision of the car at the bottom of the cliff. They wouldn’t understand why Xiao Yu ended up in a mental ward. They wouldn’t understand why Joanna Hunter’s life was in danger. They would think I was a terrible writer or that they were stupid. Both J. and M. went for the latter. Thank God, C. who had listened to me talking about the plot, said, “Do you describe the flood?” OMG. Of course I do. Where was it? That was Sunday, Dec. 31. I don’t want you to think I did all this calmly and quietly. I could barely remember how to turn the computer on, and I wasted a good deal of time staring at the Kindle upload page, which I could not now comprehend. I felt as if I had never seen it before. I shook of course. I had a dry mouth. My fingers blundered. Well, that’s what got the red MGB lost in the first place. As I went through the Vellum version the umpteenth check, I saw the heading “Chapter Five”. It didn’t need to be there. Right below it was “5. The Red Top-Down”. I went to the tools and clicked “hide in book”. The tool did its job all too well. I didn’t. I didn’t do one more sweep as I should have. At first, a KIndle employee, K, working late on Sun, New Year’s Eve, answered reassuringly, saying they would review the change and if it was a serious error, they would forward a link to buyers so they could get the chapter. Serious, yes, serious! I shot back. On New Year’s Day, I bought new versions for 5 friends I knew had downloaded it. Kindle wouldn’t let them “buy” the book twice. Somehow I managed to get myself and my sister, Georgia, the updated version. I e-mailed the chapter to the others. The terrible thing was, except for C., they hadn’t missed it. Then I waited. Not quietly. I sent Kindle ever more hysterical e-mails. A. responded with increasing empathy. Once she used the word ‘noble’. No, strictly venal. But it was up to K and the Star Chamber that would examine the book for quality. It was a quantity problem, I replied. 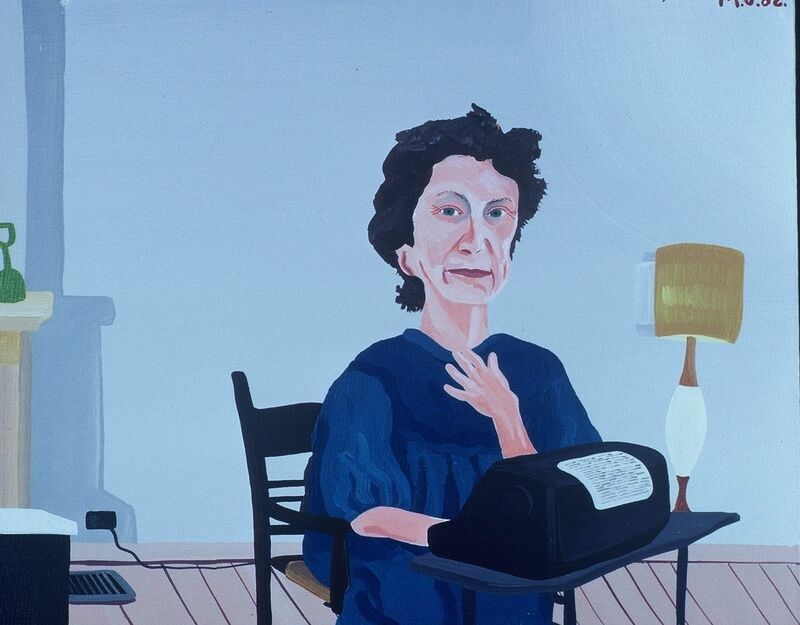 Publishing a book, like giving birth, is a jarring experience. What was once a comforting inner presence is now out there in the world causing problems. I cried at any and all TV shows. Talk about baby blues. Finally last night, I lost it. I wrote an e-mail lamenting my destroyed reputation and subsequent breakdown. I felt as if I were praying to an absent God. But still I was careful. You don’t want to piss God off too much. Then I went to bed and read Fire and Fury – on KIndle. This morning, dear heaven, I got an e-mail. I had passed the audition. Word would go out to all 104 readers telling them how to get a new version. Vellum is a formatting program, recommended by Joanna Penn in her blog. “Why I changed from Scrivener to Vellum.” It formats your book in about 10 seconds in 8 different formats, including Print On Demand. It’s way too easy to use. See above. Oh, my children used to call our green 1963 MGB the top-down. The bear came down from the mountain in the late afternoon. She wasn’t hungry. She had eaten well, but she was missing the cub. Thus I began my mystery in the summer of 2014. I was temporarily marooned in a hot hotel room. I could see the mountain from my balcony so why not weave it into my mystery. I wrote and wrote. Various things happened. I found myself writing in widely different rooms with different scenery and colder temperatures. I ended up in another place I never expected to be, on the 14th floor of an apartment building. In a suburb of Toronto! There I discovered I was ready to publish my second book. So, find an agent, find a publisher. I had the tools: books that told me how to write a killer query letter and three kinds of synopsis. An almost up-to-date copy of Jeff Herman’s comprehensive list of both. It’s a fat book, so the one before that and the one before that, etc. had gone into the recycle bag. Somewhere I still have a collection of rejection letters for my previous book, most formulaic, but at least one from an agent called Victoria dissecting my character. So self-publishing again, an ebook but now, hurray, a paperback, print-on-demand. Things had changed since 2012. My nephew is now capable of designing a cover and a website. (Sorry Stewart Williams) I can now format my own book using Vellum. (Sorry 52 Novels) I can now use Twitter to access help self-publishing. I am following half a dozen companies that gave me advice and offer to publicize my work. Among them is Book Marketing Tools, more than generous with free information and advice. Helpfully, they inform me that 6,500 books are published every day. What do I care? Last year I declared an income of $120 from my writing, with a net loss of only $571 (all figures Cdn). Clearly, I’m on a roll. I had looked at Book Marketing’s time-line for how to prepare for a book launch earlier, but now I downloaded an up-to-date one and set about reading it in front of that floor to ceiling window on the 14th floor. I wish I could say that it left me laughing. I wish I could say I didn’t go for the Alan key to remove the locks that kept my windows from opening more than 4 inches. Evidently, I should have started marketing this book long before it became a gleam in my eye. Ideally, the week I was born. There’s a strategy that’s been around for 20 or 25 years. Artists are encouraged to draft their friends into their marketing process. Thus I was instrumental in getting a friend a show hung in a club I belonged to. I thought I had already done my bit by buying more of her canvases than I needed. Then I found I was also expected to serve refreshments. Exactly why would anyone from that group of six people want to become my ‘street marketers’? And are they actually expected to knock on doors? But this is mean. Book Marketing Tools just wants to help – and possibly to sell me advertising space on Twitter. Agents demand to know if we indie writers are up to editing, proof-reading, printing, publicizing, all those things a real publisher does. Well, yes, if Book Marketing Tools has anything to say about it? Getting the Hawk off the Ground: editing con. This post is one of a series of posts about my experience writing and editing my mystery, Hour of the Hawk, which may interest and help other writers and mystery readers. The previous two are linked below. When you go on-line for advice on how to edit your novel, you are advised that you need a professional editor – by professional editors, of course. They say this is essential if you are going to self-publish. Been there. Done that. Paid for formatting in both Kindle and Smashwords by 52 Novels and for a cover design by Stewart A. Williams. Still haven’t made back the costs, so I’m glad I didn’t add another $500 for an editor. It’s my fault Never Tell didn’t sell. It was a memoir about an abusive childhood , and, although it has a bouncy, resilient narrative voice, I lost heart trying to market it. Of course, I went the self-publishing route after a valiant effort to find an agent. Here I am again. The Book Butchers also advise that you do your own edit before you hire an editor, and let you download free advice: 25 Self-Editing Tips for Indie Writers. As we know, you have to give away your work to build a market these days. They say you can save money by getting your book into better shape before you submit it to them – if you have the nerve, given their name. Plus you save them the bane of my teaching life, correcting grammar errors.I found their ideas useful. I downloaded Stein on Writing ($9.99) onto my iPad,and found his editing advice more helpful. By now I was taking multiple trips through my manuscript as I followed instructions. I also signed up for thecreativepenn.com. Joanna Penn advised a three step edit: a structural edit, a line edit for word choice, grammar and sentence structure and a proof reading edit handled by someone else. There were a number of other e-books I considered, but I figured the basics had been covered. I have a friend who is a great proof reader, but she can’t do my book because a bear cub was harmed in its making. Off-stage,I hasten to add. We don’t witness the cub’s death by game warden, nor do we witness its mother’s revenge, which, while somewhat misguided, is fatal. I told her it is fiction, but she remembered that such a thing actually happened in the mountains where I was staying and that made it real enough for her. As I said last time, I taught English. Critic A learned from me. Critic B also taught English. Critic C can cover a page with red ink. I trust the real proof reader at the end of the line will find only typos. Or not. In my next post, later today, I will go back to the topic of editing for narrative voice. Okay, I need a new direction. Writing the blog post on Cockroaches took three days and was absorbing. I had to go back through it on my iPad reminding myself of names and sorting out the red herrings from the real resolution. I neglected to say in my review that the plot was not memorable. The difficulty arrives from the fact that I’m more or less stuck here in a mountain village in Kern County, California far from Toronto, as a result of a family illness. There are days when I am superfluous to need, but then again, a relapse occurs and I’m fully involved. I don’t even have time to think. Other days like this one, I am at loose ends despite bear incursions. Because I’m a big reader of mysteries, several people have suggested that I write a mystery. I thought about it. Okay… I’d need a crime, a locale and a detective. I could set it here in this mountain village. Wait Mar Preston has already done in Payback, although I didn’t recognize the happy, friendly village I know in the misanthropic town she depicted. Besides hers had a town hall, whereas the real place has only one centre of administration, the club house. This village is unincorporated. In other words even its roads are private property and privately maintained. The streets are patrolled by security guards, although the sheriff rides in for serious matters. So I suppose I could write a truer picture of our remote mountain valley. Most of all, I don’t have a scientific background except for Biology 101 which taught me how to dissect a pig embryo. I suppose I could make it all up from my extensive reading and my watching of CSI, but I am loath to do so. It’s possible that television writers take liberties with fact. And I have no experience of group work in policing. I could write about group life in a high school prep room. Pretty cut-throat especially before smoking was outlawed. Actually I could depict two older women, who have no investigative qualifications except curiosity. And mystery reading. One of them, the elder, would be irrepressibly garrulous, a little deaf and charmingly dotty who could worm information out of a stone wall. The other an ex-English teacher, more reticent, but with a mind like a steel trap. I suppose Clara would want a slice of the royalties. Anyway, that sounds too fey and Agatha Christie has already captured the market. I’m reminded of the conversation between the writer and the doctor at a party. Doctor: When I retire, I’m going to write a novel. Writer: And when I retire, I’m going to take up medicine. So, no, I think not. I could find another indecipherable novel like The Luminaries, study it carefully and blog about it. The Luminaries post draws about 150 hits a week, once 164 in one day. Any suggestions? I have embarked on the project of following The Outlanders by Diana Gabaldon on Starz and reading the books, but those stories are pretty decipherable. They are historical romances, no matter what the author says. I could start writing a memoir about this illness, but the patient will write her own as and when. For the time being, I sit here on another sunny warm day on the edge of the pine wood, writing a blog about my inability to get a good idea. I swear I’ve marked a hundred “personal” essays from students just like this. When I finished reading Kazuo Ishiguro’s novel Never Let Me Go, I sat still on the sofa and thought about it. I felt unbelievably moved. What is it really about? Is it about our inhumanity to each other? Certainly, there is that. 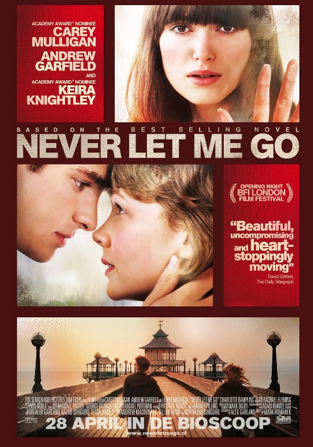 Set in an alternative 1990s Britain, Never Let Me Go depicts Hailsham, a boarding school where children are encouraged to be creative and are given frequent medical examinations. They don’t go home for holidays. Hailsham is their home. Are they orphans? Gradually, as they grow older we learn as they do that they have been cloned to become donors, organ donors. The novel was short-listed for the Booker prize in 2005, but I steadfastly refused to read it because I was too squeamish. Being stuck on a mountain made me less choosey and, having more or less enjoyed Ishiguro’s When We Were Orphans, I downloaded Never Let Me Go on my iPad mini. Whereas the stilted voice of the detective in When We Were Orphans irritated me, the humane voice of Kathy in Never Let Me Go drew me in immediately. Very soon I loved the three main characters, Kathy, Ruth and Tommy. They are being raised outside of normal society so when they are released into it to live out their abbreviated lives, they can only guess at how it actually works. For much of the time, they are equally in the dark about the donation process. Mercifully, so is the reader, although we do eventually see Ruth and Tommy in recovery between donations. Kathy is their carer supporting them through the process. Four donations seem to be the limit, during or after which, donors complete. Kathy is about to finish her years as a carer and start being a donor. Is it possible that there really is a way to get a deferral if donors can prove they are in love? The book had a cathartic effect on me. Like a Greek tragedy, it incited “pity and terror”. No doubt this had to do with the fact that I had spent much of the last few days sitting by a loved one with a serious illness – a very heart opening if fearful experience. A never-let-me-go experience. At the same time, Peter L. Bernstein’s book about risk Against the Gods came to my attention. Bernstein contends that people are not so much risk averse as they are loss averse. He quotes Amos Tversky who says that “the human pleasure machine is much more sensitive to negative than to positive stimuli”. We can imagine a few things that would make us feel better, but “the number of things that would make you feel worse is unbounded.” And some losses we know we could never recover from.